The Kliq beta application has recently been submitted to the iPhone app store. 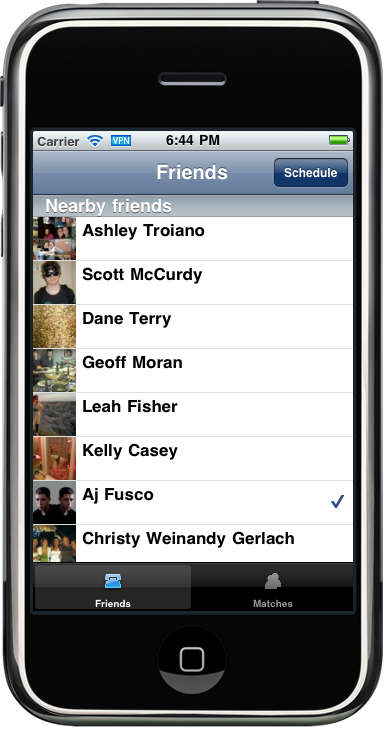 Kliq allows you to schedule a meetup with nearby facebook friends or a friend-of-friend at a nearby location in three thumb taps. He [Zuckerberg] didn’t build Facebook so he could have a social life like the rest of us. He built it because he wanted the rest of us to have his. Surely you want our social lives, not Mark Zuckerberg’s :-). On that note, off to dine with family and meetup with Columbus friends.